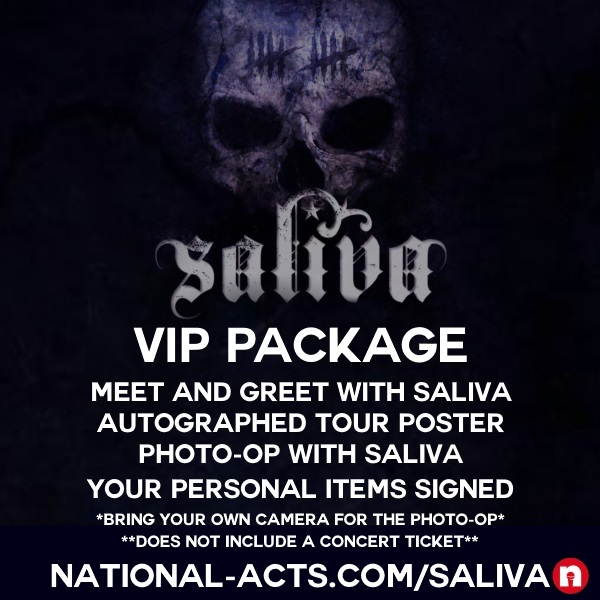 Tickets for Saliva VIP - TEMPE, AZ in Tempe from National Acts Inc.
*MOST MEET AND GREETS OCCUR 1 HOUR PRIOR TO SALIVA'S SCHEDULED PERFORMANCE. YOU WILL RECEIVE A CORRESPONDENCE FROM NATIONAL ACTS WITHIN 24 HOURS OF THE SHOW WITH THE CHECK-IN TIME. TYPICALLY, WE HAVE ALL VIPS CHECK IN AT SALIVA'S MERCH TABLE IMMEDIATELY AFTER DOORS OPEN AND THE SPECIFIC MEET AND GREET TIME WILL BE GIVEN TO YOU WHEN YOU CHECK IN. © 2019 National Acts Inc. on behalf of Saliva. All sales are final. Tickets are non-refundable.